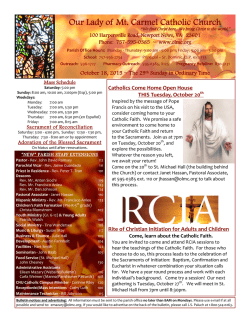 Come, learn about the Catholic Faith. in St. Michael Hall from 7pm until 8:30pm. possible and send to: emazary@olmc.org. 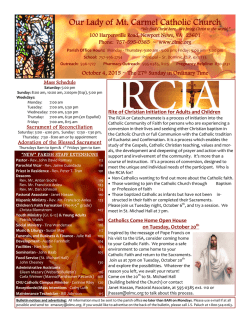 If you would like to advertise on the back of the bulletin, please call J.S. Paluch at 1-800-524-0263. Wednesdays in St. Michael Hall. All are welcome! 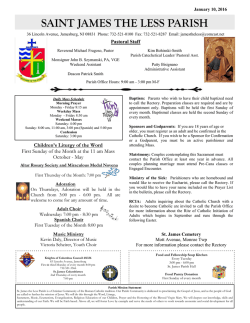 contact Janet Hassan at jhassan@olmc.org. are $15. This event is sure to sell out fast! Contact Janet Hassan at ext. 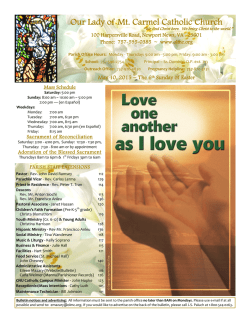 110 or jhassan@olmc.org for tickets. Chapters 16 – 22, pages 91-126.
send a parish bus if there is enough interest. 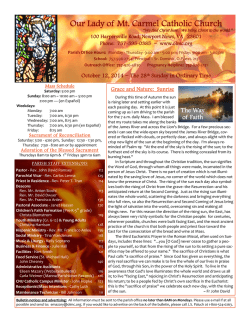 Email Janet: jhassan@olmc.org if you have already registered and are interested in the bus. held at the Richmond Convention Center on Saturday, January 16, 2016. Speakers are Mark Hart and Fr. Dan Beeman. 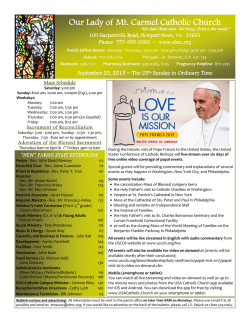 The Diocese mandates that all those who minister with children or youth must take this training prior to volunteering. 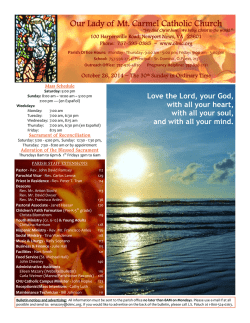 Saint Pius X (School) (Norfolk), Sat., Oct. 24 at 10:00am. 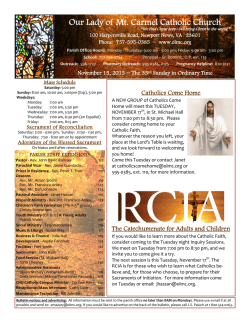 Registration to the left of the page and select Richmond, Va.
(Diocese). You can also view other sessions at this link. 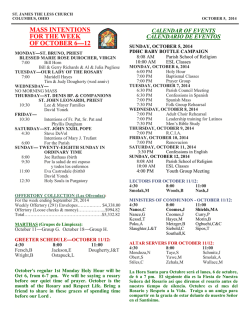 the 5pm Mass and wrap up at 8pm. sign up on the youth ministry website. grade. This year’s Rally will include fun events, keynote addresses, Catholic Olympics, Lunch, and Mass! 13. Checks can be made out to OLMC. 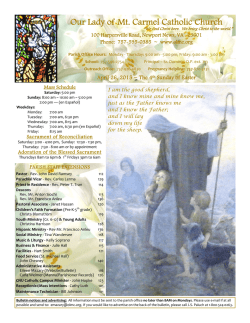 What’s offered for children at the 10:00am Mass? out at Mass & return before the Eucharist. Registration is free and easy using KidCheck. toothbrushes, soap, shampoo, lotion, mouthwash, deodorant and hand sanitizer. The children will assemble personal care kits at the workshop. Parent and child should attend together. office for more information or to register. early to accommodate family and godparents schedules. 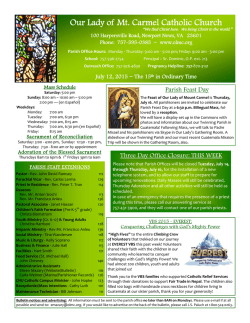 @ 595-0385, x107 or e-mail cblomstrom@olmc.org. 11:15am, the second Sunday of each month. 595-0385, ext. 117 to sign up. the system. For planning purposes, please register soon! loving our neighbors has global dimension. struggle to feed themselves and their families. people with families, hopes, and dreams for a better future. hunger and ask for your guidance to free more. and Environment. Look in the bulletin next week for complete details. St. Martha's Guild will meet at 7:00 PM on Monday, October 12, at the home of Kathy Nowinsky, 109 Haviland Dr, NN. Please call Kathy at -596-4376 if you cannot attend. Blvd. in Newport News to celebrate October birthdays. Newport News at 11:30 on Thursday, October 15th. 7:00 pm at the home of Ann Svelan. questions, contact Robbie DeBartolo 286-4253. “Overcoming Gridlock” on Friday, October 30, at 7pm in St.
reservation. Please include the names and ages of your children when you RSVP. plans to attend and be with us on this special day! Learn to relax and meditate through this art form. Presented and led by Laurel Vanderjugte. upbeat, hope-filled group and you should come give it a try. Gathering Room of the church. offering will be taken up to help cover expenses. sold after all Masses this weekend and at the Parish Office. Fall Bake Sale and Coat Collection- Re-scheduled! at 7pm, and have some fun with the Spanish language! tbourne@cox.net or 599.8357 any night until 8pm. of Normand & Jeanette Desmarais. Next weekend we will celebrate World Mission Sunday. donación en la Colecta 2015.
ministerios son componentes vitales en la Colecta Anual. encontrar a Jesucristo en OLMC y llevarlo al mundo. Si usted desea, podrá hacer su donación en 10 cuotas mensuales, lo cual hace que con facilidad apoyemos a los ministerios de nuestra iglesia diocesana, mientras cubrimos las necesidades de nuestras parroquias. Agradecemos de antemano su generosa colaboración en esta Colecta 2015.
o Pastoral. Tu servicio a Jesucristo a quien has reencontrado en esta jornada es muy importante para tu jornada espiritual y pastoral Si quieres ser parte de esta evangelización, contacta a las personas indicadas. Mujeres Hispanas, llenas de Gracia. cambios en las Vidas de las Mujeres. en Martes y 7 de Octubre en Miércoles. El programa de Estudio fundacional; “Mujeres Hispanas llenas de Gracia”, PARA EL MES DE OCTUBRE, Ya esta abierto. Para registrarte llama a la oficina. SACRAMENTOS DE PRIMERA COMUNION Y PRIMERA RECONCILIACION. PARA NINOS ENTRE LOS GRADOS DE 2DO. A 5TO. DECORANDO UNA MESA CON ARTESANIAS DE TU PAIS. Países que hacen falta de representación. Esperamos tu apoyo para esta celebración. de la Primera Comunión y/o la Confirmación. en el Salón de Reuniones. SACRAMENTO DE LA CONFIRMACIÓN PARA JÓVENES. Buying or Selling Real Estate? Call us!